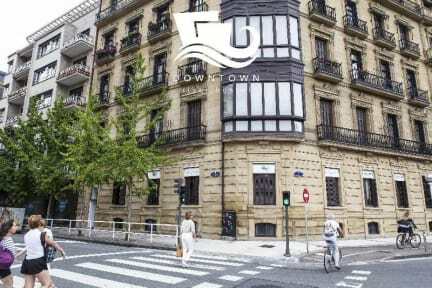 Downtown River Hostel i San Sebastian, Spania: Bestill nå! Dedicated to all ages, it is a uniquely design property in downtown San Sebastian with the best modern facilities,world famous services, fun atmosphere and an ideal central location.It´s just a 5 minute walk to Zurriola (surfing) beach,10 minutes to the traditional bahia 'la concha', it is right in the heart of the central city shopping area and is right next to the Old Town. If you are looking for an enjoyable experience and are tired of stuffy dorms, overcrowded communal areas and lifeless accommodation, then Downtown River Hostel is just the place for you! 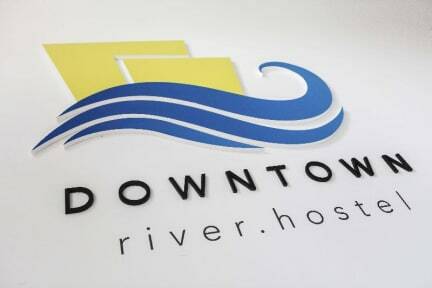 Downtown River is created for the modern backpacker who knows what a quality hostel looks like. It is built for comfort but its done in style: soundproofed rooms designed for optimal comfort,huge guest kitchen, spacious bathrooms and the most friendly, helpful service by our fabulous staff. We also provide laundry facilities and a fully equipped kitchen. All rooms include lockers. Each bunk bed has an individual reading lamp, outlet for charging electrical devices and hooks for wet towels etc. And i guess it wouldn´t be complete if we didn´t provide you with the best night you´ll ever have in San Sebastian with our pub crawls ever Tuesday, Thursday and Sunday night. We also provide walking tours, a Pintxo Pote Crawl and also Paella nights! Why wouldn´t you stay with us? *Guided activities: tasting tapas tour,hiking and pub crawl. *Free Internet. You can find Wi-fi in the kitchen and in the rooms. *Super comfy beds with clean sheets. *Free Luggage storage before Check in and at check out!. *Unlimited, 24h free hot showers. *Kitchen Facilities,opens from: 8am to 11pm. *Check in time at 12.00 pm. *Check out time at 10:30am. We hope to see you soon so you can enjoy our hospitality and city! For anyone who needs to save money and time in order to get the most out of their spending - Welcome to our hostel!.